According to a UCLA engineering alumnus, in 1993 a fellow alumnus, who happened to run one of the most advanced and secretive aircraft development organizations in the world, says the key to the technology that will allow us to travel to the stars, without taking a lifetime to get there, lies in ESP. Ben Rich was the director of Lockheed’s Skunk Works from 1975 to 1991. Skunk Works is a division of Lockheed Martin that develops super high-tech aircraft, and is responsible for developing the U-2, the SR-71 Blackbird, the F-117 Nighthawk stealth bomber, and the F-22 Raptor. In a recent interview with Open Minds, Jan Harzan, the new director of the Mutual UFO Network, told us about a presentation by Rich he attended in which he feels Rich shared some amazing insight. Like Rich, Harzan received an engineering degree from UCLA. In 1993, Harzan received an invitation from the alumni association to attend a talk by Rich at the alumni center. Harzan attended the lecture with his friend Tom Keller, who is also an engineering alumnus of UCLA and shares Harzan’s interest in UFOs. Keller wrote a book on the topic titled, The Total Novice’s Guide to UFOs, which was published in 2010. Harzan estimates there were about 200 engineers in attendance. Rich’s presentation consisted of a slide presentation outlining his 40 years with Skunk Works. The last aircraft he discussed was the F-117 which was developed in the early 80s, but was not revealed to the public until the late 80s. Rich alluded to more advanced technologies which have been developed since the F-117 but still remain secret. After the lecture, Harzan says 20 or so engineers gathered up around Rich to ask more questions. One lady asked about the technology to take ET home, but Rich sort of ignored the question. However, after being pressed by a couple of the other attendees, Rich asked one of the engineers if they thought it was possible to travel to the stars. Harzan says Rich did not say what equations he was referring to, but Harzan assumes they are what are known as Maxwell’s equations. However, he admits that this is just a guess. Harzan says Rich stopped and looked at him, then asked Harzan if he knew how ESP worked. Jan says he was taken aback by the question and responded, “I don’t know, all points in space and time are connected?” Rich replied, “That’s how it works.” Then he turned around and walked away. Harzan doesn’t know if he gave the answer Rich was looking for, or if Rich was simply referring to ESP as being the key to how the technology works, but he does believe there is something to Rich’s response. What we’re going to understand is that our ‘secret’ government has been hiding this fact for ages. In an effort to transition the US and other countries through its reach to a cabal-run oligarchy, our shadow government has been lying about off-planet corporate slavery rings, alien abductions, benevolent beings who can only do so much until our collective consciousness elevates, and much, much more. We will learn that aside from extraterrestrial beings visiting our planet and many different ET races tinkering with our DNA over millenia, there are ancient humanoid races that are more than 10 million years old. We will learn that we are not helpless, as we have been programmed to believe. We are, in fact, a rare humanoid race that has an incredible range of emotion and creative power. We will learn that our minds and emotions can either fuel chaos on this planet, or restore it to its rightful place of peace and cooperation, of care for others at least as much as ourselves. Almost 70 years ago, an FBI special agent wrote a report about the presence of beings from another dimension here on Earth. This particular report was kept secret until 2011, when the FBI declassified a series of documents and posted them on their FOIA library, The Vault. Although nearly seven decades have passed since it was written, the issues it dealt with are of even greater relevance today. The anonymous FBI agent expressed his concern with regard to the flying saucer phenomenon; he acknowledged the fact that the UFOs were examples of technology far superior to that of our own and believed that any attempt to attack one would result in deadly retaliation. The visitors are human-like but much larger in size. They do NOT come from a “planet” as we use the word, but from an etheric planet which interpenetrates with our own and is not perceptible to us. The disks posses a type of radiant energy or ray, which will easily disintegrate any attacking ship. They reenter the etheric at will, and so simply disappear from our vision, without a trace. The region from which they come is not the “astral plane”, but corresponds to the Lokas or Talas*. Students of esoteric matters will understand these terms. They probably can not be reached by radio, but probably can be by radar, if a signal system can be devised for that. * Loka and tala are Sanskrit terms first used in the metaphysical systems of ancient India. Loosely put, loka means “place” or “world” while tala means “inferior world.” Every loka is linked to its corresponding tala and can never be separated. It’s quite interesting to notice that the FBI would quote such esoteric matters in their official papers. Perhaps these metaphysical concepts are closer to reality than previously thought. The information contained in this report seems to validate the Interdimensional Hypothesis, a theory that proposes an alternative explanation for the UFO phenomenon. It was based on the ideas of ufologists such as Jacques Valée, who suggested that UFOs are indeed extraterrestrial in nature, but do not come from this reality. Instead of mastering interstellar travel and visiting us from distant parts of our universe, the UFOs could be caused by the materialization of visitors from alternate realities or dimensions that coexist independently to our own. This hypothesis is supported by the strange behavior UFOs exhibit, such as the ability to rapidly materialize/dematerialize. You can find the report on the official FBI Vault HERE. Mysterious footage said to depict three UFOs racing by Planet Earth is causing an out-of-this-world discussion on YouTube, as some people think it’s proof-positive of alien life. The 4-minute long video titled “UFO Mysteries: UFOs, Angels Or Biological Creatures Seen Leaving The Earth?” was uploaded a week ago and has more than 214,000 views. The video, reportedly shot from the International Space Station, shows three unidentified flying objects shooting upward out of Earth’s atmosphere. Close to 200 people have commented on what they think the video is actually showing, including the usual, classic responses such as swamp gas or a weather balloon. Commenter Michael Clottey is among the viewers saying it’s proof of alien life. NASA has not provided any explanation for the curious lights. The International Business Times reports, “This is not the first time conspiracy theorists claim NASA has inadvertently captured extraterrestrial activity. Earlier in January this year, UFO hunter Toby Lundh spotted what he claimed was an UFO just outside the space station as he was monitoring the live feed on his laptop. A UFO soaring over the Bronx in New York City was seen by dozens of New Yorkers on Saturday, leading to multiple 911 calls from panicked and freaked-out residents, alarmed by what one caller described as a “fireball” in the sky and another called a “flying spaceship.” But what was the object, really? So far, no one has been able to explain it. Even more odd, when a New York Times reporter called the police to ask what was going on, he apparently ran straight into a stone wall. The police, apparently, refused to discuss the UFO sighting reports. Times reporter Liam Stack made the call after hearing repeated reports of the UFO sighting. Are any of you at E 149th & Bruckner Expressway in the Bronx? Apparently a lot of people have called 911 to report a UFO there tonight. But while the Times passed on publishing a story about the UFO, the New York Post had no such compunctions, even dispatching reporters to the Bronx to interview residents who saw the UFO in the early evening hours in the skies above the United States’ most populous city. Another New Yorker, 25-year-old Andres Morales, took a photo that shows the alleged object, visible in the upper left hand region of the photo. Here is a closer view of the UFO in Morales’ photograph. Others who saw the object were not quite as quick to jump to conclusions. @liamstack @fidmart85 I was there around 7:15 and saw nothing more than glare from a setting sun. The UFO sighting over New York City comes just a week after a UFO was reported hovering over a hotel in Virginia Beach, Virginia. There have been numerous UFO sightings in New York City over the years, however. Perhaps the most famous occurred in 1974 — famous not as much for what the object may or may not have been, but for who saw it. The sighting was reported by former Beatle John Lennon, who had relocated permanently from England to New York City in the early 1970s. Lennon even immortalized his sighting in his 1980 song “Nobody Told Me,” in which the legendary rock star proclaims that he “ain’t too surprised” to have seen a UFO over New York City. Back in the day, it kind of made sense that there weren’t a lot of photos of UFOs, because people didn’t have cameras at their disposal all the time. But now? Not so much. Not only do we have cameras on our phones, but we can also share our evidence instantly with millions through Twitter and Facebook. So when a strange assortment of lights appeared in the sky around Houston in August of last year, people immediately got out their phones to share the experience. UFO or not, this evidence proves something was up that night. A guy named Andrew Pena shot this video while trying to capture a local storm and saw something even more shocking instead. Andrew wasn’t the only one who saw an unidentified craft on the expressway that night. These photos were posted on Twitter by another Houstonian just minutes after Andrew’s video was captured. Notice the perfect ring of the lights. What crafts do humans have that create a visual like that? Oh wait. None. According to another perceptive Twitter user, the craft even appeared on Houston’s east side. I’m sure some people will find more than one logical (i.e., non-extraterrestrial) explanation for all this, and maybe these images aren’t evidence of an alien invasion at all. The neat thing about the times we live in, though, is that whenever Earth experiences a close encounter of the third kind, there will be hundreds if not thousands of people around to document it from every angle. Hey, even selfies could help us fight against an alien invasion. Historic Apollo 15 video footage shows a saucer shaped UFO hovering over a crater apparently observing two moon walking astronauts. The Apollo 15 video was uploaded to YouTube on April 5, and raised the possibility that it is an advanced spacecraft monitoring the Apollo mission. Whistleblower and astronaut testimonies have revealed the Apollo 11 mission was monitored by two spacecraft hovering over a crater, allegedly giving a warning to NASA. The spacecraft may have been extraterrestrial in origin. Another more intriguing possibility is that the Apollo 15 UFO belonged to a highly classified space program, again warning Apollo astronauts and NASA from future moon missions. In the video, astronauts Jim Irwin and David Scott are on the moon’s surface. Scott is heard giving commentary as he films Irwin and the surrounding terrain. Scott sweeps through an area showing a white floating saucer shaped object apparently hovering over a crater’s rim. His first comment when seeing the object is to say “whoops” and to then pan away. Scott focuses the camera on the ground which is curious given the strange hovering object near a crater. His “whoops” comment and immediate panning away suggests that he is deliberately trying not to focus in on UFO. Nevertheless, the camera sweeps past the object several times without stopping or focusing on it. This leaves the viewer wondering why he ignored the strange white object. 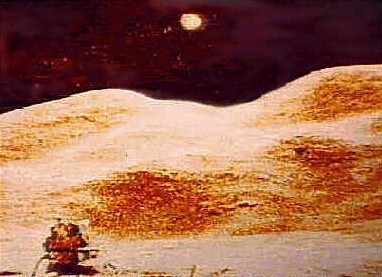 Scott’s behavior raises the possibility that he was under orders to ignore the UFO and instead film more innocuous features of the moonscape. Was his curious filming behavior a result of some warning NASA had received concerning the Apollo program? on the moon in their June 1975 issue. Click image for more photos. A possible answer emerges from events associated with the 1969 Apollo 11 moon landing. After the arrival of the Apollo 11 lunar module on the moon’s surface, there was an alleged radio transmission from Neil Armstrong during a mysterious two minutes of radio silence. In the transmission, Armstrong said that there were giant UFOs hovering over the horizon watching the moonwalking astronauts. What’s there? Mission Control calling Apollo 11. Armstrong: I can’t go into details, except to say that their ships were far superior to ours both in size and technology – Boy, where they big! … and menacing …. No, there is no question of a space station. If NASA was indeed warned off the moon, then subsequent missions such as Apollo 15 only went forward as a public relations exercise to avoid a “panic on earth” over the early termination of manned moon missions. The saucer shaped UFO filmed by Apollo 15 may well be an advanced spacecraft there to monitor the Apollo mission, and to give a firm warning to NASA to put an end to the program. If so, was the UFO extraterrestrial in origin, or is there another more conventional explanation? Recently, two whistleblowers have publicly emerged revealing the existence of secret space programs with bases on the moon. Randy Cramer and ‘Corey’ (aka GoodETxSG), both claim that they were first taken to a secret base on the moon in 1987 as 17 year olds where they separately began 20 year tours of duty with their respective space programs. They called the secret moon base, Lunar Operations Command, and claimed it is used by personnel belonging to secret space programs, and visiting extraterrestrial spacecraft. In an email, “Corey” claims that Lunar Operations Command began to be built in the late 1950’s over an abandoned moon base. 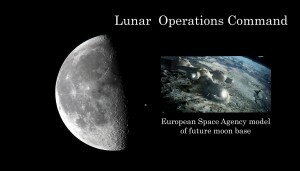 If Corey’s and Randy’s testimonies are accurate, Lunar Operations Command was already in operation during the Apollo moon landings from 1969 to 1972. According to Cramer, in early 2014 he received orders from his military superiors in a covert branch of the US Marine Corps to reveal the existence of secret space programs taking place on the Moon, Mars and elsewhere in our solar system. In Sept 2014, Corey publicly emerged claiming that he has been contacted by a relatively new group of extraterrestrial visitors that are facilitating public disclosure of secret space programs and visiting extraterrestrial life. Corey claims that one of the secret space programs, “Solar Warden,” is part of an alliance of secret space programs and visiting extraterrestrials to disclose the truth to the world public. Most startling is his claim that among this space alliance are members of between five to seven ancient human civilizations that have their own ongoing space programs. The Apollo 15 video of a saucer shaped UFO on the moon may be hard evidence of an advanced spacecraft monitoring the moon landings. Scott’s strange filming behavior was likely due to orders he received as a result of a warning delivered to Apollo 11 astronauts.The craft associated with the Apollo 15 video and the original Apollo 11 radio transmission by Armstrong, may not have been extraterrestrial in origin, but instead belonged to a secret space program that did not want NASA to establish a permanent presence on the moon. As a primarily civilian agency, NASA’s presence threatened to expose the activities of one or more secret space programs and/or extraterrestrial civilizations on the moon. This is especially plausible if a facility such as Lunar Operations Command was already in operation. April 4, 2015 – A government whistleblower recently stated that officials are baffled as to why numerous extraterrestrial crafts have docked themselves on the opposite side of the moon. For example, a slight change in the magnetic field may affect the Schumann Resonance where the frequencies are more derived from pure love or as some may call it, “Christ Consciousness”. It may also open up our minds to their fullest collective capacity where we all have instantaneous abilities, such as telekinesis, ESP and other psychic or metaphysical abilities.